Jess Breach scored another two tries as England women's winning start to their Six Nations campaign continued. England Women made it two bonus-point wins from two in the 2019 tournament as they beat France 41-26 at Castle Park in Doncaster. 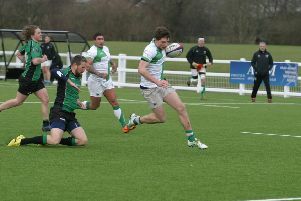 In front of 4,674 fans on a dry but chilly day in south Yorkshire, England took the lead against the reigning Grand Slam champions after Katy Daley-Mclean’s cross-field kick was superbly taken in the air by West Sussex ace Breach - who was with Chichester and Pulborough RFCs as a youngster and whose family are Felpham-based - to dot down. After Sarah McKenna was held up over the line, a break down the wing from Kelly Smith was quickly recycled for Poppy Cleall to hit a short line and power over. Despite prop Vickii Cornborough being shown a yellow card, England scored again with a player less when Emily Scarratt's clever grubber bounced up perfectly for the onrushing Smith to gather and sprint clear. 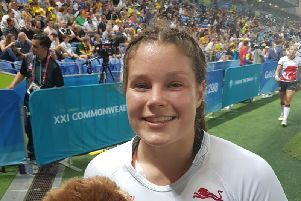 England were not done before half-time, when McKenna's superb line break set up Breach for her second as she dived over in the corner as the bonus-point was secured before the break. France responded in the opening stages of the second half when Safi N'Diaye got their first points, but some strong forward work close to the line saw England respond and Cleall crossed for her second. An excellent break from France scrum half Pauline Bourdon gave the visitors hope, before Red Rose replacement Hannah Botterman finished a series of pick and drives and then Catherine O'Donnell went over in the corner for England's seventh. But Romane Menager crossed in the final play of the game to secure a losing bonus-point. England head coach Simon Middleton: “That was a massive win for us and I was really pleased with how we came out and attacked and kept our discipline. We let France in during the second half but that only shows what a world-class side they are.